There's some kind of Hercules movie coming out in North America tomorrow starring Dwayne "The Rock" Johnson. Do we smell what the Rock is cooking? Yes. Some kind of Hercules movie. We just said that. Anyway, why don't we take this chance to review a game based off the best Hercules ever to exist in the history of anything? No... not Kevin Sorbo! We're talking about Disney's Hercules! Yes, it's time for a review of the retro variety with Disney's Hercules Action Game for the original PlayStation! When I was growing up around the time of the movie's release, I was obsessed with Disney's Hercules. The animated motion picture regarded content that I was crazy about, Greek mythology, and it offered that content in a charming package with action and a lot of laughs. I bought the McDonald's Happy Meals, I bought the toys, and yes, I played the games. 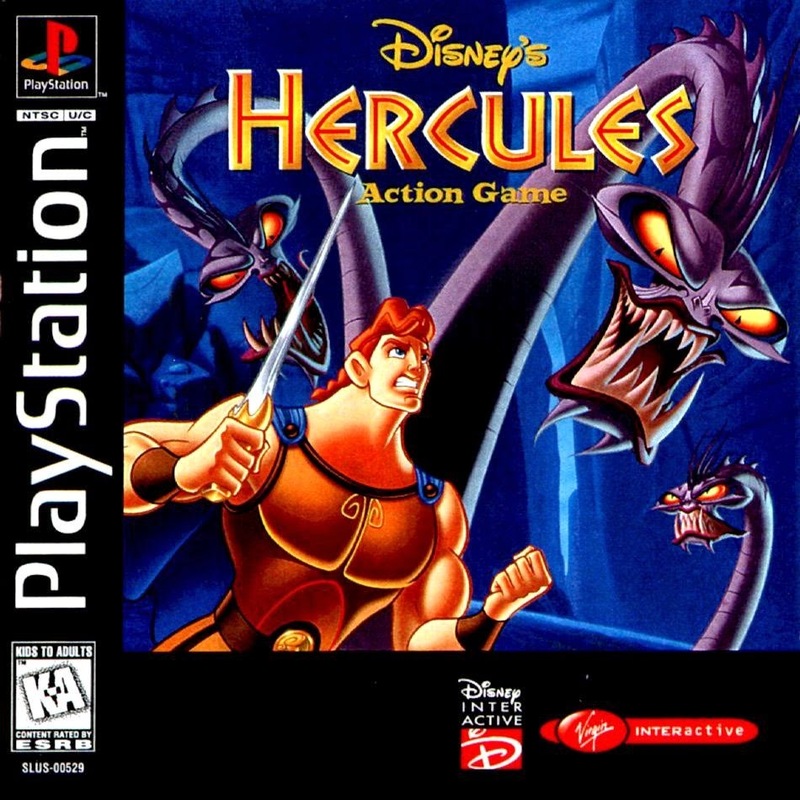 One of my first PlayStation games ever was Disney's Hercules. When I saw it appear on the PlayStation Store, I couldn't resist buying it to see if it would live up to the fond memories and nostalgia I had for it. Did it, or was that task too much of a herculean effort? 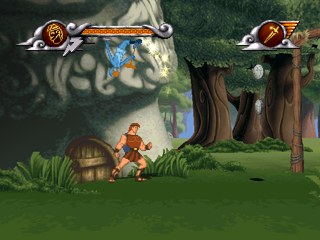 The companion game to the Disney's Hercules movie follows the movie's story in an authentic way, even sporting many scenes directly taken from the film to bookend each level. For those uninitiated, Disney's Hercules follows the story of Hercules, child of the thunder god Zeus, as he trains with Phil to become a hero. It goes on to involve a lost interest, Meg, and several encounters with the god of the underworld, Hades, who wishes to take over Zeus's territory. 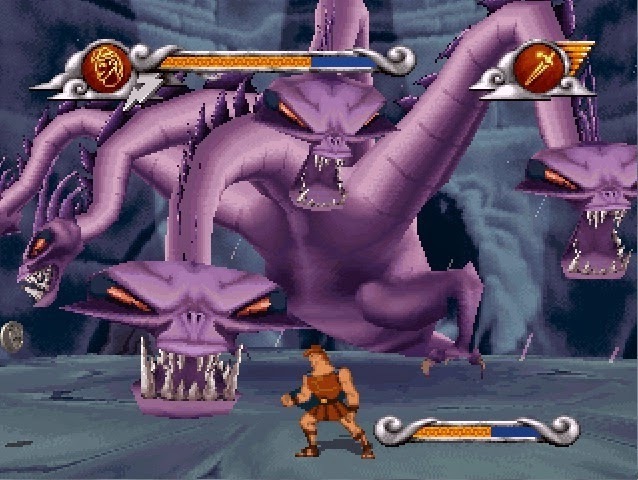 Disney's Hercules Action Game (which is a title that doesn't really flow, so I'll just be calling it "Disney's Hercules") is one part 2D platformer, one part 3D runner, one part boss battles, and one part shoot-em-up. There's a good variety of gameplay styles, as you can tell. However, it's a tad disappointing that the best part of the game, the 2D platforming is only featured in the first half of the game, and then it's gone from sight. To make matters worse, there's only three of these levels included! 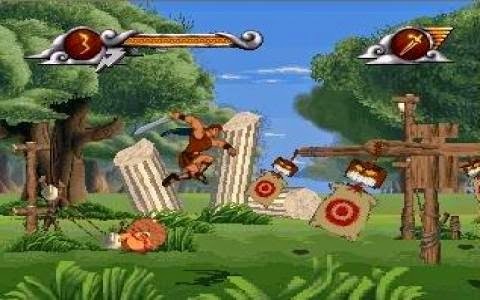 The 2D levels feature Hercules, swiping his sword at enemies, leaping from platform to platform, searching and exploring levels for secret areas, and in some parts of levels, moving from different planes, such as transitioning from the foreground to the background. This turns the typical move-right-to-left gameplay of traditional platformers on its head and offers even more chances for exploration. There are three levels in Disney's Hercules which have you in a perspective behind a running Hercules, going through an obstacle course of sorts. You can speed up and slow down to leap over chasms, time your movements correctly in order to avoid hazards, and you can choose way you wish to go on the two levels which feature split paths. These two initial types of levels are engaging and enjoyable to play. It's a shame stereoscopic 3D wasn't available at the time, as it would not only make the game look more impressive than when the game originally released, but it would greatly assist with jumps, particularly in the 3D running obstacle course segments of the game. Boss levels are very quick affairs, sadly, that make this already short game feel even shorter. The physical contests against the Hydra and Medusa take place in circular arenas. That's all these levels are. I would have loved to seen a build-up to these encounters, whether they be the aforementioned 2D platforming levels or the 3D runner levels. As is, when you beat these brief battles, your expression and thoughts will pretty much be summed up with one question: "That's it?" "get up on the Hydra's back"! Finally, there's one level where you ride aboard Hercules's trusty steed Pegasus through Mount Olympus' skies as you avoid the strikes and attacks of the legendary and otherworldly Titans. This level is basically a shoot-em-up. 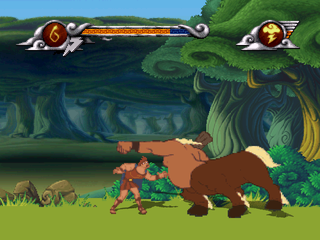 Well, technically it's a slash-em-up, as Hercules sort of doesn't possess a gun to ward off threats with, thankfully. 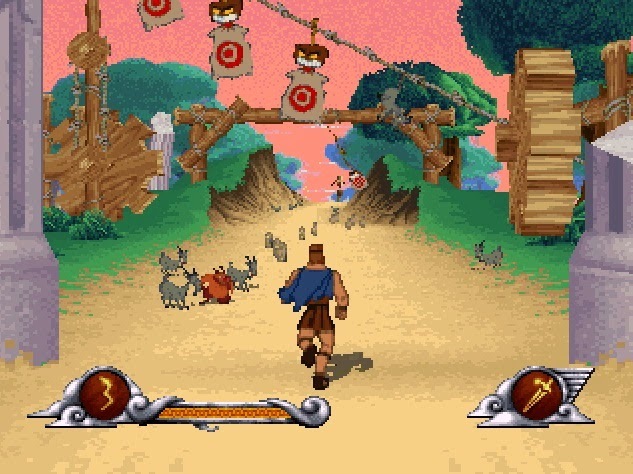 Disney's Hercules is indeed a quick game to beat. The developers obviously knew this, as the save system is rather old-fashioned. In order to save your data after a level, you must obtain all four hidden vases each time. Furthermore, to get continues, you need to collect all of the letters which spell out HERCULES. It adds some replay value to find the locations of letters, but many levels have it where if you miss a letter, you can't backtrack unless you intentionally lose a life and get sent back to a checkpoint to try again. Also, it's important to note that you should really play the game on the Normal difficulty or harder, 'else you won't be able to reach the final two levels of the game. The animations and characters of Disney's Hercules are exquisite. I'm still impressed by what Disney Interactive and Eurocom were able to muster with the original PlayStation's power. It by no means animates as smoothly as games today, but it's still quite a looker. Environments are nicely detailed with wonderful parallax scrolling for 2D levels and polygonal objects in 3D levels that don't harm the eyes. The actors from the animated film do all the voice work for this game, which is a magnificent touch and makes the whole package feel like the real deal. Finally, the music is suitably catchy, featuring plenty of tunes that will make your herculean toes tap! Disney's Hercules may suffer from a short campaign and a disappointing amount of 2D levels, my favorite part of the game. However, the entire package is worthwhile to check out, and it's a game that begs for repeated play-throughs whether for speed runs or just casual play. The game is available for purchase on the PlayStation Store in the form of a PS1 classic, so PS3 and Vita owners can enjoy it either at home or on the go whenever they want. He put the glad in gladiator, and Hercules's game puts the fun in functional, which is exactly what this game based off the animated film is.